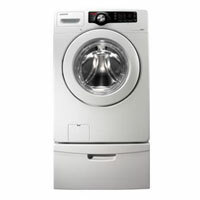 This Samsung model offers all the special features you’d expect from a high end front load washer at a great budget price. With an Energy Star rating, it cleans laundry quickly and efficiently, saving you money each month. The washer senses load size and automatically adjusts to give each load a thorough cleaning. As with any front loader, you have to bend down unless you get a pedestal and clean the gasket regularly to prevent mold growth. Sporting a modern, attractive style, it’s as pretty as it is functional. It can be found as low as $500, an incredible bargain for a quality front loader.